Want to keep the menu more casual? This section is full of finger food ideas that you can use at your baby shower. They are portable and casual types of food that do not require the use of utensils. This allows ultimate flexibility for serving your guests for both time and location. Looking for more food ideas? We have lots of great recipes in our food gallery! Get more ideas over in our main dishes recipe page. In a large pot, boil macaroni noodles according to the instructions on the box, removing them when they are al dente (almost done). Meanwhile, line 2 cupcake pans with cupcake liners and preheat oven to 350 degrees. Mix Ritz cracker crumbs, melted butter and 1 cup shredded cheese in a medium sized bowl until mixed well. Spoon 1 tablespoon and 1 teaspoon of the mixture into each cupcake liner and press flat with the bottom of a cup. Once noodles have been cooked, drain and place in a large bowl. Stir in remaining shredded cheese, the boursin spread, salt, and 2 tablespoons of the cold butter. In a separate bowl, mix together the eggs, milk and sour cream. Pour liquid over the noodles and mix well. Evenly divide noodle mixture between the 24 muffin cups. ( You will have some leftover). Sprinkle a little extra shredded cheese on top. 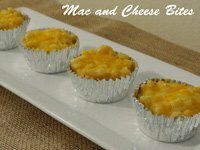 Bake mac and cheese bites for 20-25 mins and let cool in muffin tins for 10 minutes before removing. Serve warm. Prep homemade onion rings below before starting so they are done around the same time as the sliders. 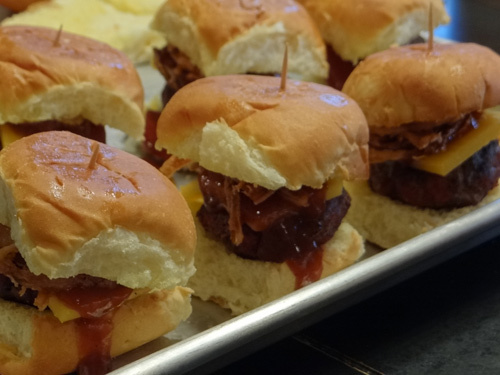 For the sliders, separate ground beef into 2 ounce portions. Roll into balls and flatten into patties. Sprinkle with salt and pepper. Grill on a barbeque grill until cooked through . Add sliced cheddar cheese to each burger at the end of grilling and allow to melt. In the meantime, cut slider buns in half. Kings Hawaiian rolls come attached, so we just cut the whole batch in half with a large serrated knife. Butter the rolls and toast in the oven. 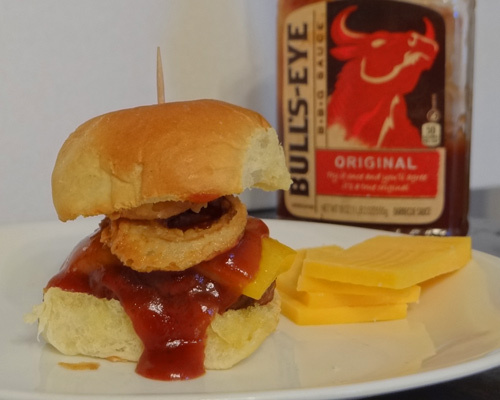 Assemble sliders by placing one beef patty on a toasted bun and drizzling it with some barbeque sauce. 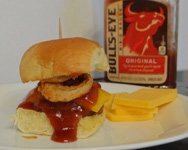 Pile onion rings on top of the sauce and cover with the top bun. (You can add more sauce to the top bun if you'd like). Use a toothpick to hold all layers together.Enjoy! Slice onion into thin slices. Place in a large covered container and cover with buttermilk. Soak onions in for at least 1 hour. In a large bowl, combine flour, salt cayenne and pepper and whisk together. To cook onions, fill a large pan with a quart of oil. (You can also use a deep fryer if you have one.) While oil is heating, grab a handful of onions and place into the flour mixture. Cover onions in flour and shake off excess. Place onions into the hot oil and cook on both sides until they are golden. Place cooked onions on a plate covered with paper towels to absorb excess oil. Continue cooking onions until you have enough for your sliders. Place pork roast in a 9x13 pan. Mix together the salt, pepper, brown sugar, paprika and cayenne pepper in a bowl. Rub the seasoning mix all over roast and wrap with plastic wrap to seal in flavor. Place roast in the refrigerator for 2 hours to allow seasonings to soak in. Unwrap roast and place in a crock pot. In a medium bowl, mix together apple juice, apple cider vinegar, worcestershire sauce, liquid smoke and garlic powder. Sprinkle a few spoonfuls of the sauce over the roast. Then pour remaining liquid around the roast so the seasonings are not washed off of meat while it cooks. Cook roast for 8-10 hours or over night. 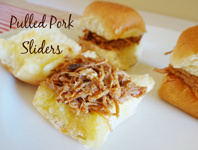 Remove pork roast from crock pot and shred. Place shredded meat back in the crock pot and cook for an additional 30 minutes. Remove all the broth from the crock pot except for about 3/4 cup of liquid. Add barbeque sauce to meat and mix well. Butter and toast slider rolls in the oven before serving. Spoon mixture on rolls and serve warm. 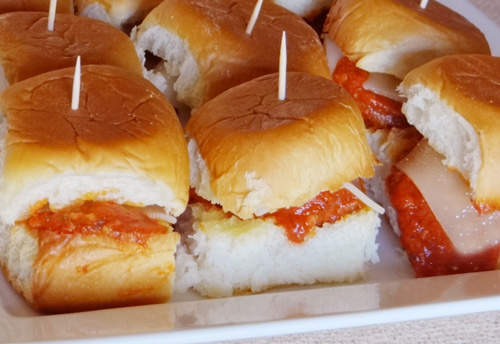 Use toothpicks if needed to hold sliders together. To make meatball sauce, heat olive oil in large pot. Add the onions and cook until tender. Add the garlic and cook for about a minute. Add the remaining ingredients for the meatball sauce above. The sugar makes the sauce a little sweeter, so I omitted it from mine. Feel free to use it if you would like. Add water until sauce reaches your desired thickness. Bring the sauce up to a boil and then simmer for at least 2 hours. Butter and toast slider rolls in the oven before serving. Spoon 1 meatball onto each roll and top with a slice of provolone cheese. Serve warm. Use toothpicks if needed to hold sliders together.